I received a lot of e-mails about the Ghia 1500 GT I wrote about in the "Weekend Quickies" post. Most of you felt that it was a really great car, but too far gone to be realistically restored. I agree. I posted it to point it out. I guess I hoped someone, somewhere, was up for the challenge. I hate to see rare old cars go to waste. Here's another rare old, odd, Italian car. This one, while needing a lot of work, is a very realistic restoration candidate. The De Tomaso Deauville was designed by Tom Tjaarda. Tjaarda designed some of my favorite cars including the Pantera, Laforza and Fiat 124 Spider. The Deauville may not be as timeless as those cars, but it's still a beautiful big sedan. (Interestingly, it shares a lot of styling cues with the Jaguar XJ6, a car Tjaarda did not design. De Tomaso envisioned this car as a Jaguar alternative and, I assume, directed Tjaarda to make it look similar.) De Tomaso powered the car with the same Ford V8 engine he used in the Pantera mated to a Ford 3 speed automatic transmission. Top speed was around 150 MPH. De Tomaso was no better at keeping build records than the other small Italian manufacturers, but all sources seem to agree that less than 400 of these cars were made. (The numbers vary wildly. One site states that 204 were built, another claims that 350 were produced.) None were officially imported to the US. The Deauville listed on eBay has had all the tough stuff done to it. Essentially it just needs paint and to be reassembled. The seller states, "Parts of the interior and the front and rear screens have been removed to aid the restoration but it is believed that all parts to finish the car are stored with it." That's good, as finding parts for this car would not be easy. 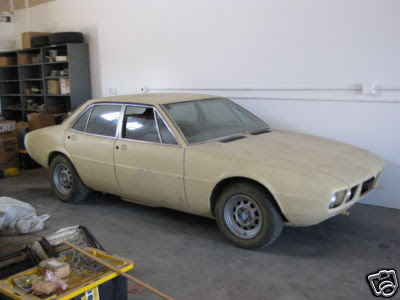 Click here to see the eBay listing for this 1971 De Tomaso Deauville. The De Tomaso website has some information on the Deauville (along with the other classic De Tomaso cars). After entering the site, use the menu on the left and click on "Cars".